Prominent & Leading Manufacturer from Mumbai, we offer vest carrier bags. With sincere intentions to preserve and uplift our reputation in the market, we bring forth a comprehensive range of Vest Carrier Bags. Our carrier bags are provided on several customized sizes & designs options so as to meet the needs of customers. 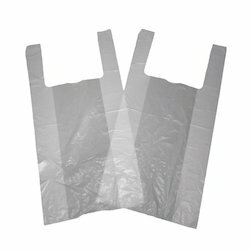 These carrier bags are designed using top notch material & leading techniques at par with internationally approved standards. Offered carrier bags are well checked on diverse parameters by our quality controllers in order to ensure its flawless range.